Summer days are long gone and now it's time to accept the less than friendly and often unpredictable temperatures of Fall and Winter. This also means dressing in layers to accommodate varied daily weather temperatures and moving in and out of buildings. The challenge many men face with layering is deciding how to effectively accomplish it for the varied roles of the week. 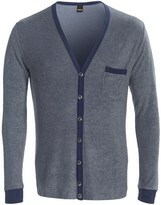 Layering for the office is much different than layering for an evening out with friends or a casual weekend. Don't worry, we've got you covered with 5 tips that will have you layer ready for any occasion. Here is our shameless plug - one Image Consultation with Devlon Paris will provide a hands-on consultation showing you how to use your existing wardrobe and a few carefully selected additions to create a look designed around your comfort and daily lifestyle. We guarantee heads will turn in your direction - end of shameless plug. The first step is to remember why you are wearing layers in the first place. The goal is to stay warm when the climate is cooler while having the flexibility to remove layers if the temperature warms. How do you know how many layers are enough? If you are warm when you go outdoors for more than a few minutes, then you have on enough layers. There is a bit of caution worth noting. The layers should not only be warm but also comfortable. If you can't put your hands down to your side then you probably have on too many layers and it is likely not a flattering look. Keep it simple, warm and a comfortable fit. A layer is defined as clothing that looks great when worn on its own. This means that more is required than just adding clothing. Each layer should look great with other layers or as a standalone look. The best way to layer is to begin with thinner layers first. Thinner layers should be worn closest to the skin. Therefore, start with cotton t-shirts or dress shirts and then layer with thicker materials such as sweaters, hoodies or jackets. The weather may look and feel blah but it does not mean that you have to. When wearing layers be sure to add colors that show personality. Although dark colors such as gray, navy and black are great for winter, adding a touch of color brings the layers to life. Be bold, execute this properly and stay cool to match the dropping temperature. The layers worn for the office are a lot different than the Friday night cocktail or casual Saturday look. Arranging layers to fit the occasion allows you to appropriately dress for the various roles that may be demanded by your weekly activities. In addition, you must feel comfortable and confident in what your wear. So, while Lenny Kravitz can get away with wearing a scarf as big as his entire body, he's also a rock star with an eccentric palate and is comfortable in that space (we are NOT recommending you do this but in case you missed Lenny's truly life size scarf - click here). The key is to layer according to both the occasion and what will make you comfortable. If you are more conservative by nature (or your workplace requires conservative appearance), that is fine. Perhaps you can use comfortable colors for the core elements of your layer and provide a splash of brightness via a pocket square or conversation starting scarf or necktie. The right accessories are great ways to hint personality just enough to show who you are without detracting from a more conservative appearance. The key to proper layering is to make sure you have the wardrobe essentials needed to properly pull off the right looks. Although layering offers a wide variety of execution options, we will focus on a few staples that can be executed multiple ways. Here are a few essentials that make the layering process much easier. This guide should get you started with the process of layering for the varied temperature moods of Fall & Winter. Want to know more? Arrange an in person or web chat with one of our knowledgeable Style Advisors to get a better understanding of how your existing wardrobe can be arranged to meet your layering needs.